Come to Shantiniketan on 20th and 21st of March for one of the most vivid, welcoming, and lively Holi celebrations you will witness in this lifetime. Introduced by Tagore himself as Basanta Utsav or the Spring Festival, this is the most important time of the year for the residents of Shantiniketan and the students at the world-renowned Biswa Bharati University who are the heart of all the celebrations. Dressed in flamboyant yellow saris to commemorate spring, the students organise and partake in the many festivities, which include a lot of music and dance. Baul singers and their soulful tunes stir the heart like nothing else and add to the spellbinding aura. Shantiniketan celebrates its significance and the role it plays in the cultural weight and history that Bengal carries with it. There’s shopping, dancing, singing, bonding with people and splashing everyone with abir in all colours from the spectrum. The vision is sure to cast a spell on you! * Make sure you have your accommodation sorted from before. There is no way you can expect to find rooms on spot. Everything is fully-booked in advance. * No matter where you’re from, we suggest you carry something in yellow to wear during the two days of the celebration to be a part of the legacy that Basanta Utsav has. 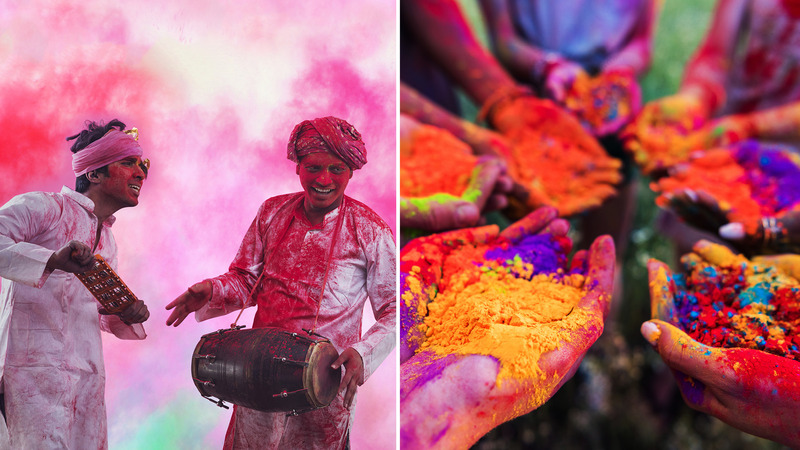 * Basanta Utsav is unlike any other Holi celebration in the country. Only dry colours, aka abir is smeared on others which is the safest and doesn’t cause any harm. Refrain from disrespecting the common rules to ensure that everyone taking part has an equally memorable time. The nearest airport is the Kolkata airport, which is located at a distance of 139 km and is connected by flight with all the major cities around the country. You can take a train to Bolpur from Howrah and Sealdah, which depart frequently or hire a private cab all the way to Shantiniketan.